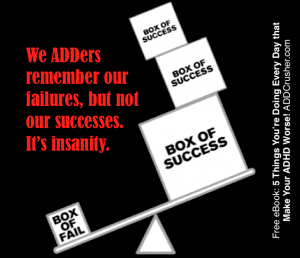 A recent guest blog I did on Carol Gignoux’s LiveADHDFree.com hit on a recurring Crusher theme: things ADDers do every day – wittingly or unwittingly – that make our ADHD worse. 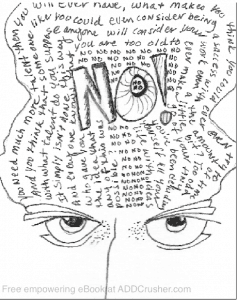 Then, just last week, I did another on Andrea Nordstrom’s The Art of ADD blog, called Three MORE Things You’re Doing that Make Your ADHD Worse! 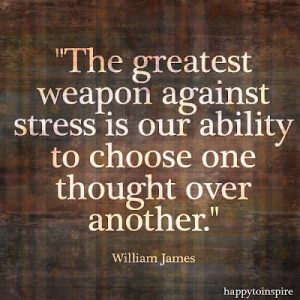 As one sage put it, “Worry does not empty tomorrow of its sorrow; it empties today of its strengths.” Indeed, mental fatigue is caused less by work than by worry, frustration and resentment. Moreover, creativity and problem-solving are stifled when the mind spins on negatives. Another sage said, “Worrying is like praying for what you don’t want.” And what you DON’T want is to make your ADHD worse. 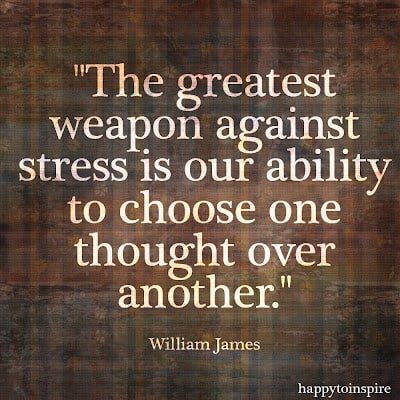 What you WANT is the mental clarity that comes with peace of mind. 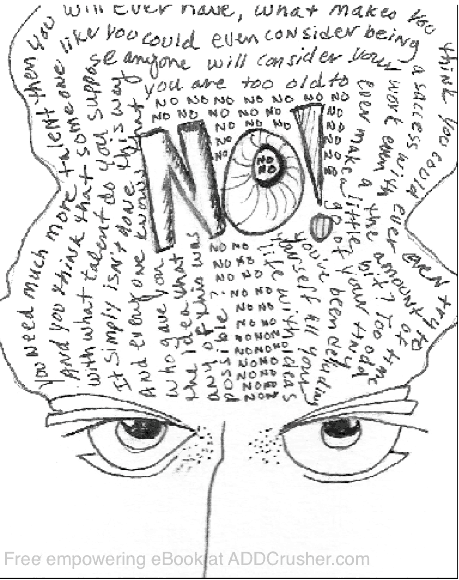 And there are ADD-friendly ways to achieve it, starting with the simplest type of meditation: observing your inner dialogue, which is cluttered in large part by needless worry…and telling it to shut up. Like worry, there are a bunch of other energy-burners going on in our inner dialogue that we should live without – or at least with less of. Future vs Past: Thoughts of the past are mostly re-hashing stuff you can’t change – so classify them as such and switch into future-oriented, “here’s-how-I’ll-do-it-differently-next-time” mode! Positive vs Negative: When you have a negative thought – about yourself, a situation or another person, LABEL it as such and move on to something else, or at least shift to a positive spin on it. Big vs Small: We are so often getting dragged down a rabbit hole by some small thing that burns energy like a big thing! If spinning on something, ask yourself if it’s worthy. Relevant vs Titillating: Titillating thoughts are the ADDer’s bane, taking us away from relevant tasks and from finishing things. Label titillating stuff as BS THAT YOU’RE NOT DOING NOW. In sum: stop dwelling and start propelling. Filter some of this BS out to move away from mind FULL to mindful. We ADDers are masters at acknowledging and remembering past failures, and terrible at acknowledging successes. It’s like failures have triple weight. You succeed 3 times and fail once but that one failure weighs in your mind more than the 3 successes. Just be aware of negative self talk. When you catch yourself on a negative, label it as BS and move on. Don’t take others’ comments and leering looks too seriously. Know the two Realities of Success. First, “Success is 99% failure.” Second, that success is not just the COMPLETION of a tough task, but any effort TOWARD completion. So, celebrate every effort no matter how small, knowing that the path to success ain’t no straight line. Way 7 in ADD Crusher™ Video II is called, “Attack the Tough Stuff Now.” It deals with procrastination, and could have been called, “Quit Psyching Yourself Out!” because every procrastinator is a self-psycher-outer, mostly with fear. A prominent coach said, “If we doubted our fears instead of doubting our dreams, imagine how much in life we’d accomplish.” And look at some common day-to-day to-do list fears, things that are painful to even think about…calling a client with bad news, or a teacher you think will HAVE bad news, going to DMV, etc. But how painful ARE these things vs actual pain — like when the dentist drills too deep? There’s no REAL pain, is there? You’re thus paralyzed by fear of imaginary pain. So, when it comes to tasks you fear for any reason, start doubting your fears and stop psyching yourself out. There ya go. The final four things that, if reduced even modestly, would make your ADHD more manageable.